A step-by-step manual for setting up your own home food growing system. It’s not too late to start, even if it’s already summer! In nine days I leave for Bujumbura, the capital city of Burundi in central Africa, where I will be working with teachers and their students to help heal the wounds and trauma of civil war. In preparation for this journey, on Thursday January 9, I gathered around me a team of friends who will accompany me in spirit, every step of the way. I can think of no better way to celebrate both the work I will be doing, and the sense of community I will come back to. 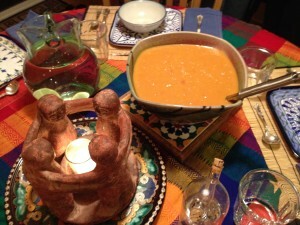 Knowing these bowls are circulating, collecting many stories, adds to the sense of connection so needed to do our work in the world. We stand at the edge of a true wilderness. No one has entered it, nor worn a path for us. There are no maps. We gather together to remind each other to seek our True North, and to encourage – to place courage in – one another. And if you find me sleeping in the snow, awaken me, lest my heart turn to ice. I picked up my bowl earlier this week. It was a gift and tender to carry away to my home. 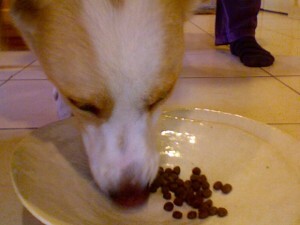 It was exciting to sit with the bowl and eat something special from it. 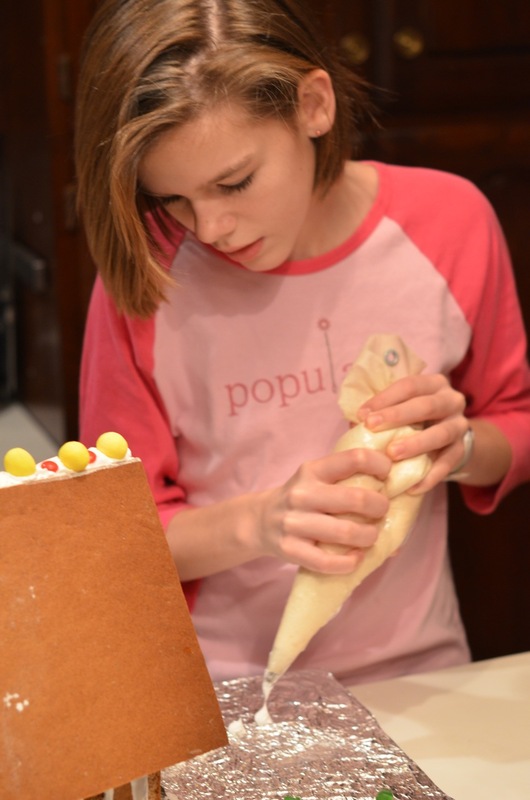 The bowl was infused with story already, even though she be young into the year of bowl stories. 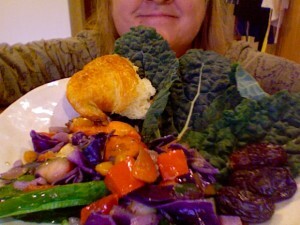 I purchased my food locally and made my way home to prepare it. The bowl had Winnie the Pooh pressed into her. I costumed for Winnie the Pooh at the Whidbey Children’s Theater a couple of years ago. Seeing the ole’ Bear again made me smile. Apropo, me thinks. 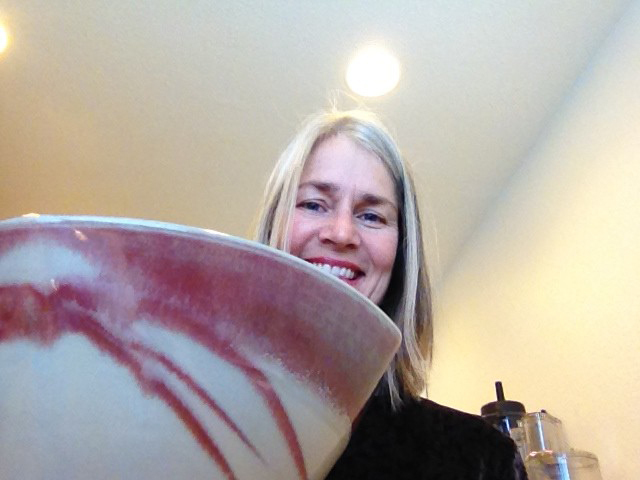 Holding the bowl to me, thanking her for the time together and to the Community I am among, sending you all the comfort and joy I felt during this time; I filled her with only good things. 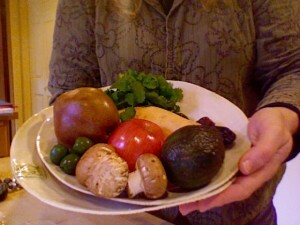 Eating slowly like I’ve done on mindfulness retreat, savoring the figs, pear and sauteed vegetables. The Dogs sat by me while I ate. They are the same color as the bowl. Filling the bowl with their treats, Bucky and Glory both got to share in the gift of story as well….very sweet. The last food I ate from her were snacks. 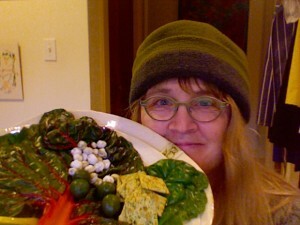 Wasabi peas, figs, Castleveni olives and spinach crackers. I returned the bowl this afternoon late in the day. It was a cold, blue skied, Mountains out, Whidbey day. Thank you ‘Winnie’ Bowl, t’was good to spend such delicious time with you. I will think of you as you make your way among my community. Knowing you will continue to bless each individual. This Christmas Eve, my sister Connie and I are remembering our mother June and what a creative and resourceful cook she was. Our extended family always gathered on Christmas Eve to share the time together and enjoy the tree, lights and family decorations that came out each year: a line of small white houses with red roofs lit from inside and nestled in cotton along the window ledge, the rotund Snowman with black top hat and red scarf holding a liquid-filled candle stick with bubbles rising when heated. 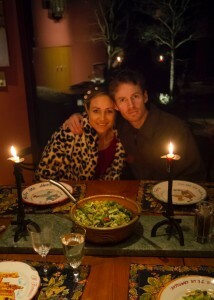 It was a time to gift each other and eat very well. 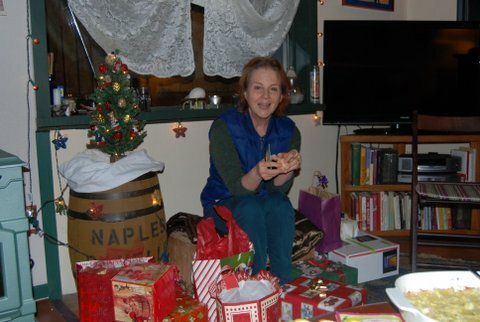 Over the years, our gifting went back and forth, from one or more gifts for every person to selecting a single family member’s name from a bag and surprising that person with a special gift the next Christmas Eve. Each Christmas there were the regular treats that my mother made for us all: delicious fudge, mouth-watering divinity, peanut brickle, special rolls, cookies…and her Graham Cracker log. Connie remembers it being made days before and carefully stored at the very back of the refrigerator until that night. When I thought of making something for one of the bowls, this log came to mind. 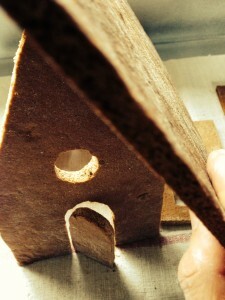 It is easy to make and lasts a long time. Slices can be served with fresh whipped cream. This year we found organic dates, if that helps in deciding to try this. It seems appropriate that these childhood memories and log are now held in this wonderful Winnie the Pooh bowl by Inge Roberts, accompanied by a poem by Judith Adams. 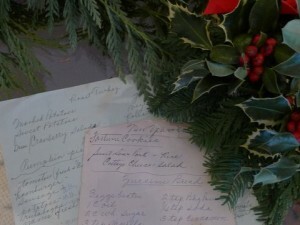 For me, the best part of this experience was again finding some of our mother’s handwritten recipes. 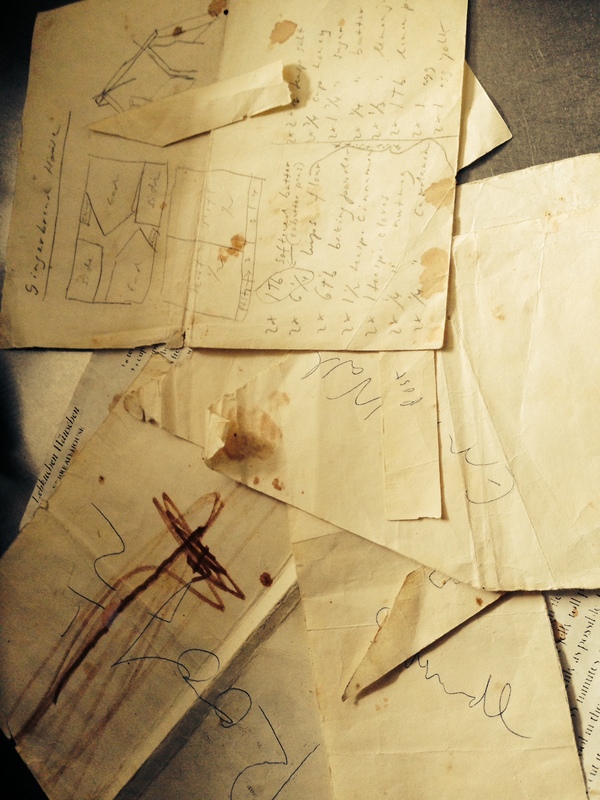 I am still amazed at how evocative these are…seeing lists for what was needed, a few of her favorite recipes, all reminding us again of just one of the many ways in which she loved us. 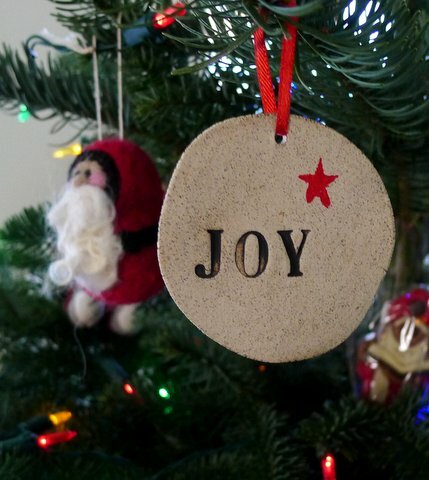 Wishing you all Great Joy! Mix all ingredients together. 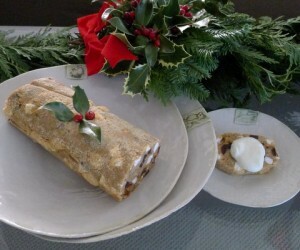 Form into a roll and wrap in waxed paper. Refrigerate overnight. Serve slices with whipped cream. 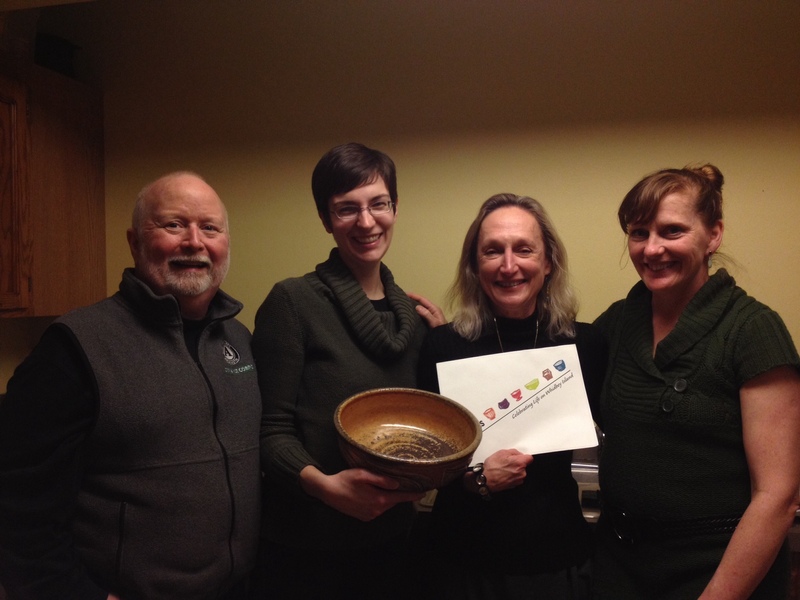 Wednesday, December 11th, I picked up the beautiful Pooh Bowl and poem and took them to the Tilth Potluck. 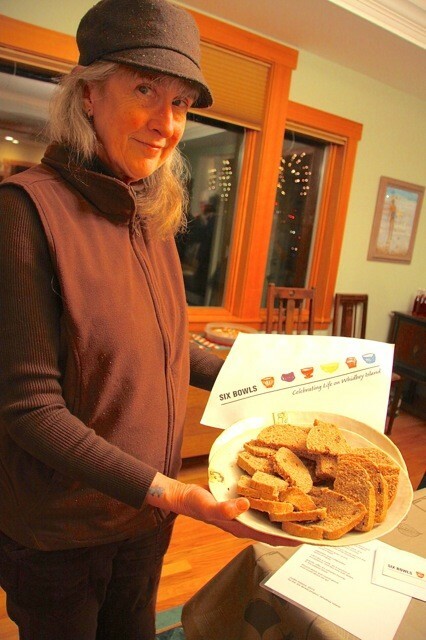 The bread I shared in the bowl came from Living Green, the wheat grown in Coupeville. 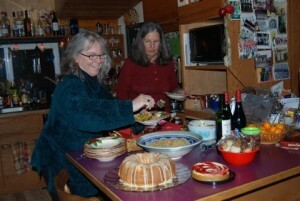 My first Whidbey community potluck, invited by Madam Tilth President Linda Good. A joyous time enjoyed by all. The bowl also reminded me of the I Ching and the chapter about how the empty space makes it functional. Then read the Tao of Pooh again as I was reminded of the book by the bowl. And lastly, the beautiful bowl reminded me of my Sister who was called Pooh and how fragile life is. I so appreciated being able to hold and share. Thank you. 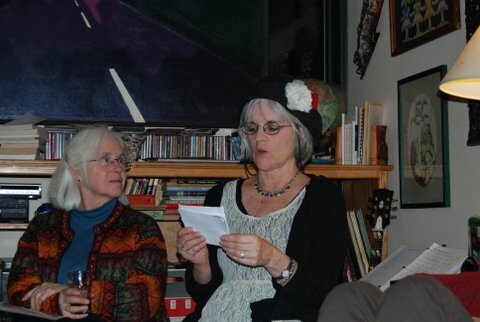 One of my joys is to be an original member of the book group, South Whidbey Read and Feed. 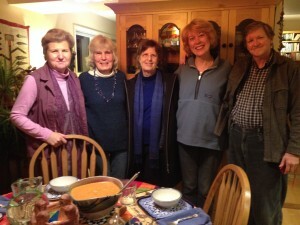 We have met monthly for over 15 years in the home of Christi Ruscigno. Members have come and gone, but we have steadfastly followed some rules. Rule #1 “you don’t have to read the book” and Rule #2, “bring good food and drink.”In December we bring poetry to share as well as a white elephant gift. 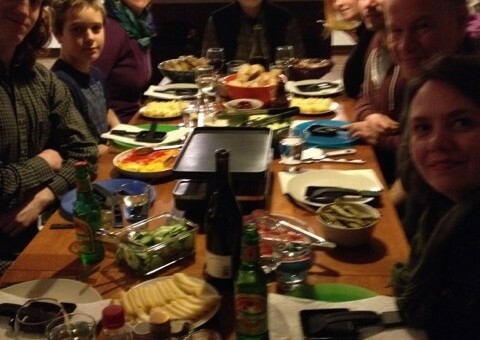 We start off by sharing food and catching up on our lives. This year I made a quinoa pilaf with dried apricots, pistachios and mint and served it in the beautiful blue bowl from the Six Bowls project. After we finished our sumptuous meal we picked numbers out of a hat. Number 1 (me) read a poem to the group. We continued around the circle, sharing poetry as our number came up. It was opportune that one of our members, Melissa Young, had forgotten to bring a poem. 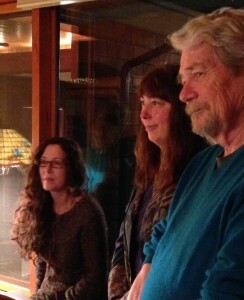 She read the two poems that accompanied our bowl, one by Judith Walcutt and the other by David Ossman. 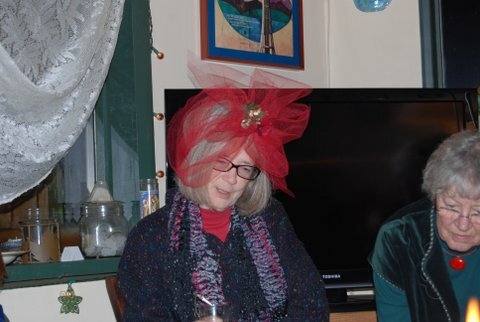 Poetry was followed by white elephant gifts. Since I was Number 1, I unwrapped one of the gifts. Number 2 could then either take my unwrapped gift or pick one to unwrap. This process continued around the circle accompanied by much laughter, hiding of good gifts while those with less desired gifts cried, “take this gift, PLEASE.” As #1, at the end of the unwrapping I got to survey the room and take whatever gift I wanted. I was pretty thrilled. Mostly, however, I was delighted to be part of a long standing tradition – a group of beloved women gathering to laugh and enjoy each other’s company. 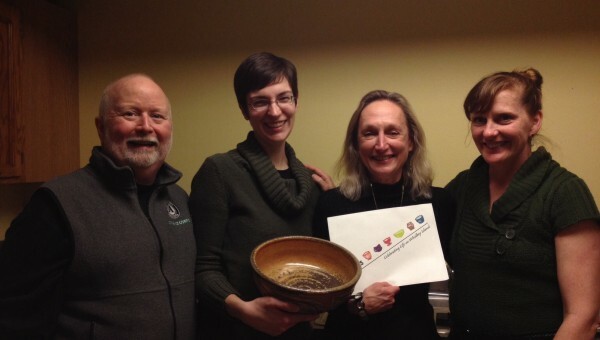 We are grateful for the opportunity to participate in the 6 bowls project. We had the bowl at our house for the Thanksgiving Holiday 2013.Our daughter-in-law, Rannveig Aamodt of Norway had a serious rock climbing accident April 2012. She fell 50 feet. Fortunately there was no head or spinal cord trauma, but she had multiple compound fractures and complex injuries of her spine, pelvis, feet and elbow. She was in a wheelchair for 3 months, and healing was prolonged. She has done well.The bowl was used for salad at Thanksgiving. We shared private thoughts and feelings regarding our reactions, fears and concerns relating to the accident. 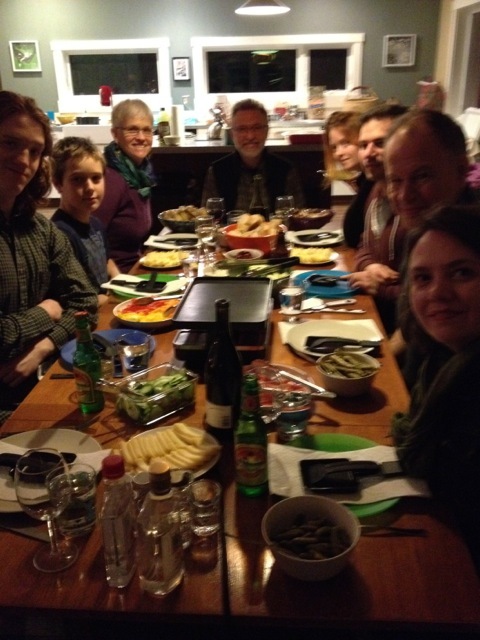 She gave thanks for family support, and we all rejoiced for her recovery, and expressed hope for Nathan and Rannveig to have a long happy life together. 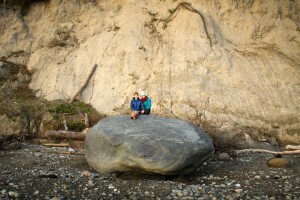 Attached are two photos, one of them at the Thanksgiving feast, with the salad bowl in front of them, the other on top of a much smaller rock at Possession Point. 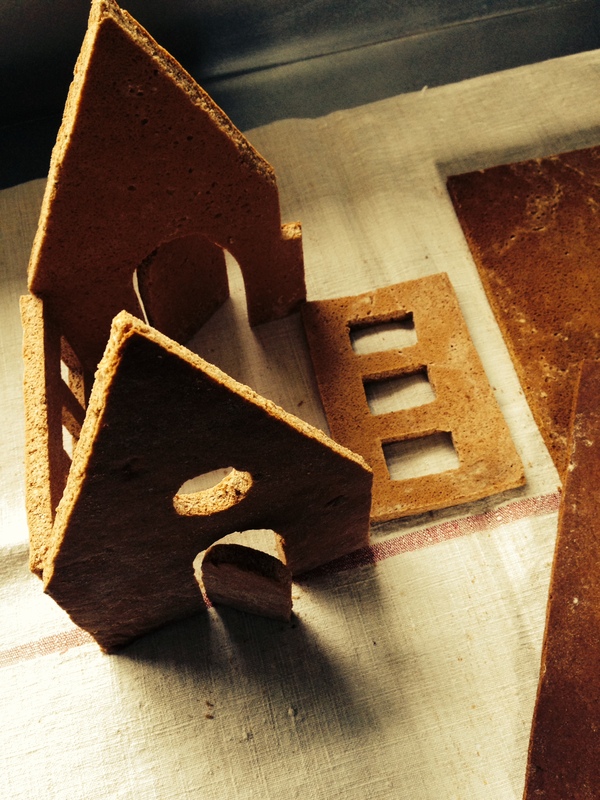 When I was very little, my mother tried to make me a gingerbread house from saved up war rations. With tremendous excitement we set out for the building adventure. Then followed rising frustration, cardboard tasting gingerbread, that runny whitish sugary mess which failed to become “construction cement” and our defeated disappointment. 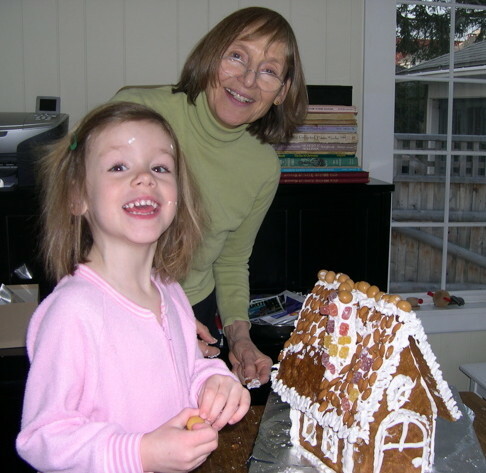 Years later I visited my best friend on Christmas morning and under her silver glittering tree stood the most perfect sugar dusted gingerbread house: fairies could have been happy around it! 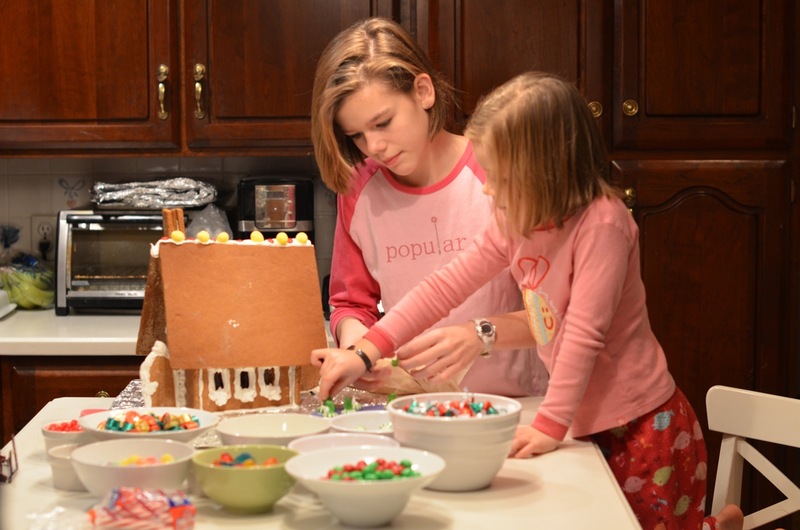 When my daughter’s third Christmas approached I was ready to reverse our earlier family failure and invited friends for dinner and then to help with the construction. The scent of nutmeg, cloves, cardamom, cinnamon and melting butter, sugar and honey, all having been baked into the brown gingerbread sheets which John and I had cut precisely into the architectural elements for our building project, filled the house. And so to work: two children, two fathers, two mothers, a table spread with gingerbread pieces, a large bowl of creamy white icing another of almonds and dried fruit (this was Marin in the very early seventies – candy out of the question, icing a necessary evil!). 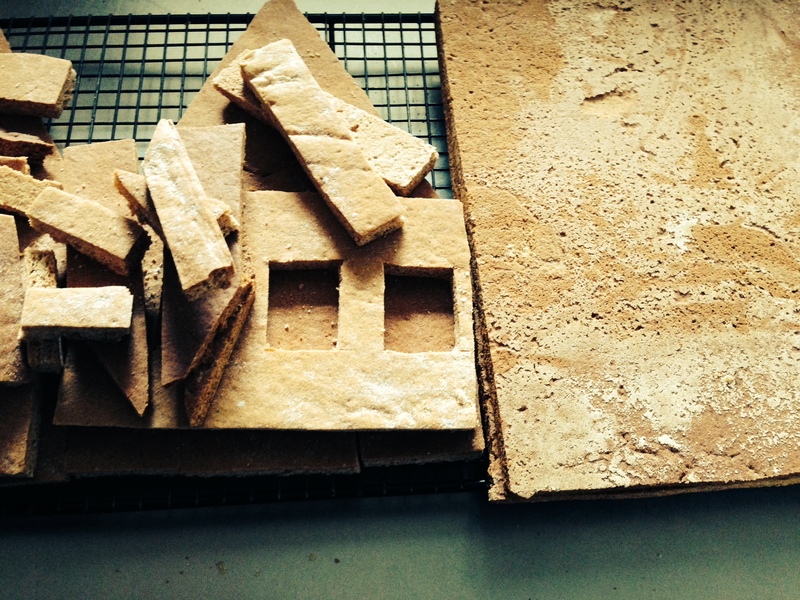 We crunch on the delicious construction cut-offs. 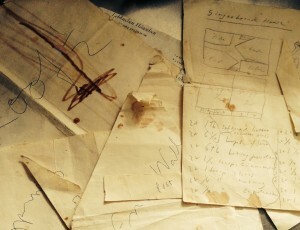 There is cider for the children, Sambucca and espresso for the parents and there are giggles and stickiness and jostling for the pastry bag with the icing of which several more batches seem essential. 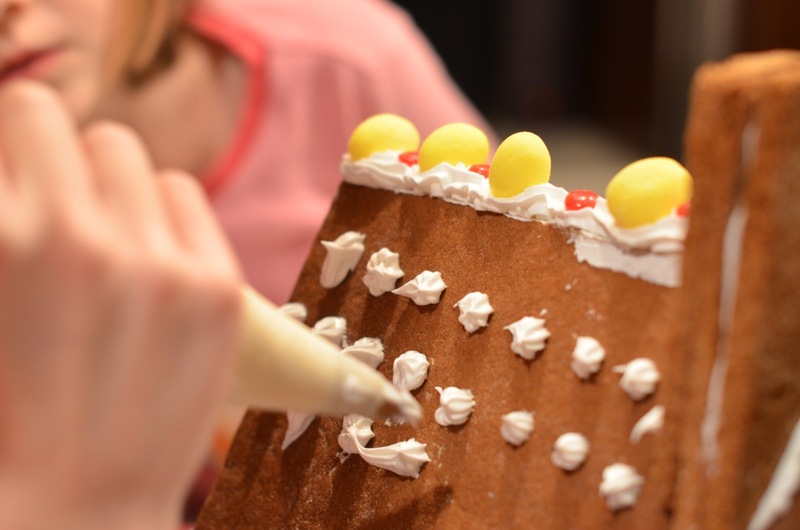 “I need a big blob for my snowman.” “My wood(cinnamon sticks)pile needs more snow.” “My front door has become unhinged.” The chimney starts its third descent: Jay demands skewers to pin it but the crisp roof does not allow this; John produces a drill from the garage: yes! Meanwhile Sue holds on to the roof, her espresso still untouched. When I urge her to let go, I suddenly see my childhood memory replayed: in stately motion the roof glides down. More icing. The roof holds. 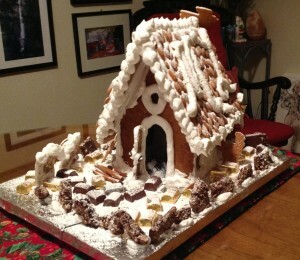 We all had had a wonderful evening and next morning our little early riser informed us that the house had “broked itself”. 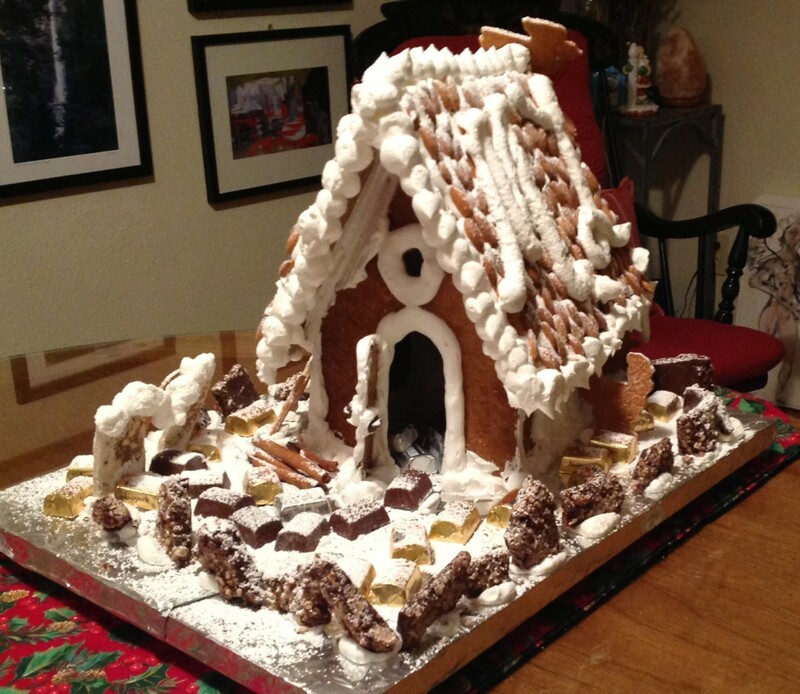 On Christmas Eve it looked wonderful – a blessing on electric drills and an abundance of confectioners sugar! 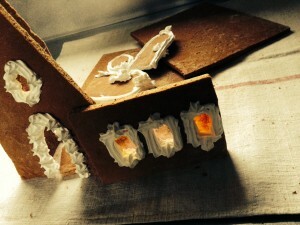 Every year since there has been a new gingerbread house for our family, ( little versions for friends as well) and now they even have stained glass windows and little battery powered lights inside!Their yearly construction was assisted by changing crews: growing kids, teenagers, empty nest friends, a fiancé, then son-in-law, the next generation. Morning-after-construction-roof-slippage was a perennial dread, until friend Pam invented the “temporary 4 semi-crushed paper cup pillars under the eves” method. 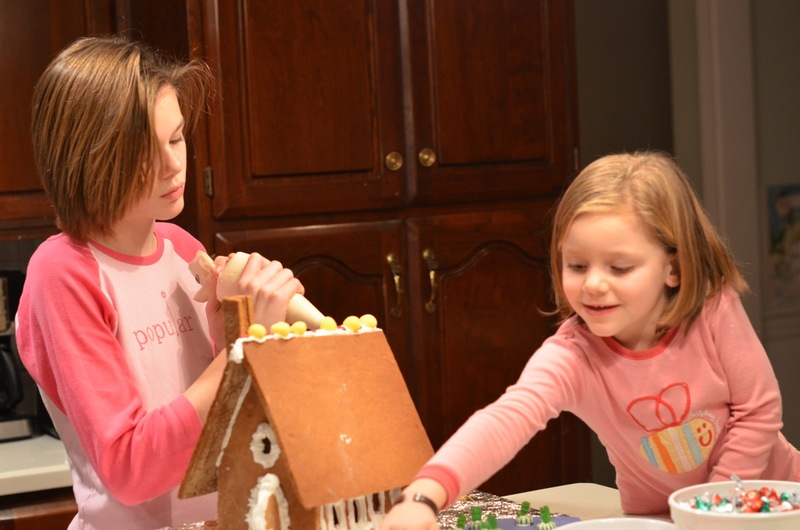 Our three grandchildren never knew a Christmas without the house. 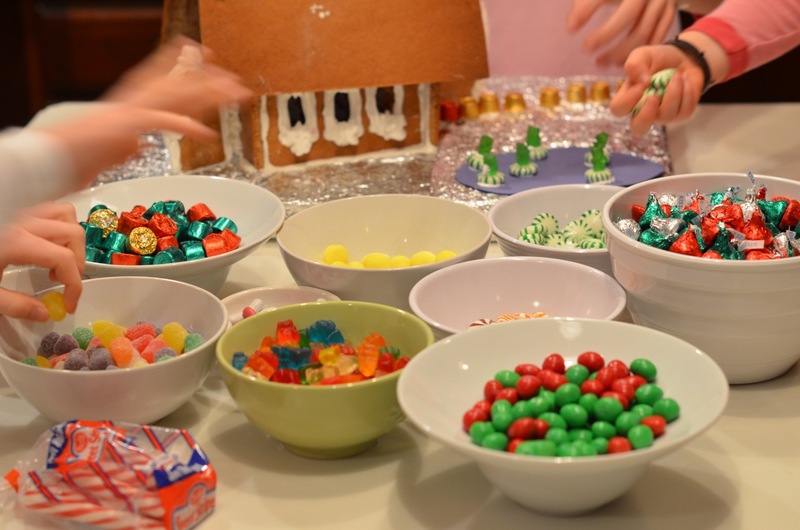 They are savvy decorators and builders and the vile amounts of toxic colored candy provide me with guilt for an entire year. Next week the parts are being sent to Boston for assembly by the entire family with two cats watching warily – hoping for flying buttresses? When John and I join the family, the house will already have been robbed of its prized decor (when one of the girls was 2 years old she was discovered on top of the dining room table, gleefully removing and eating gummy bears from the fence posts yelling for us to share her discovery – she had been asleep while her 4 year old sister Emma and I had decorated the house). When Gloria Sherman at One Spirit Garden in Clinton first heard about the project, she said “We must have a blessing of the bowls before they go out into the community” and began organizing the event. 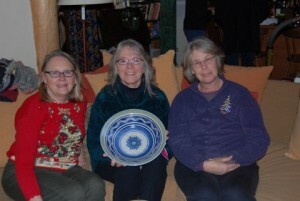 The event was intended to celebrate the achievements of the ceramic and glass artists who created the six bowls at the center of the project, and to showcase the poets whose writings will accompany the bowls out into the community for the next year. As each bowl was presented, a poet read the prepared piece for that bowl. 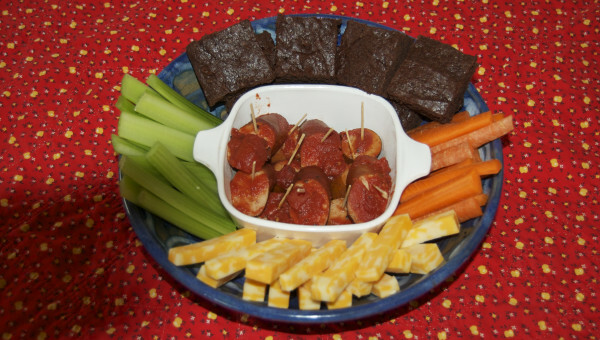 After the presentations, a buffet meal was served, under the direction of Gloria Sherman and by several local chefs. 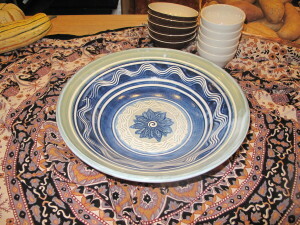 Each dish was served in one of the Six Bowls. 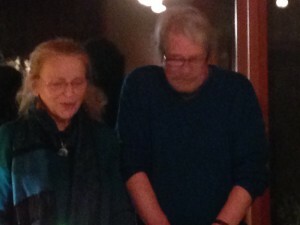 After a lively dinner and inspiring conversation, Glo and Penny brought us all to the warm living room fire, where we all joined together to cast blessings, intentions and prayers, written that evening and by visitors to the garden through the preceding year, into the fire. A beautiful launch for a wonderful project – full of good wishes and blessings for all! 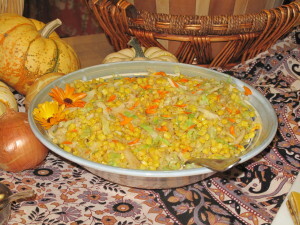 After the Blessing of the Bowls, and before Thanksgiving, this bowl served non-GMO corn and organic cabbage (cooked by Christyn Johnson) to a group of travelers on the Open Path, the inner school of the Sufi Way . 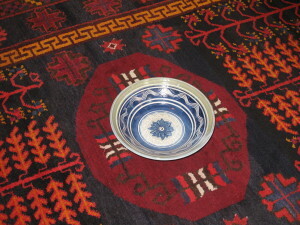 We were gathering at the Whidbey Institute for the second of three retreats in the nine month training.Before the meal, the bowl sat in the middle of the carpet in Thomas Berry Hall during one of our discussion sessions. 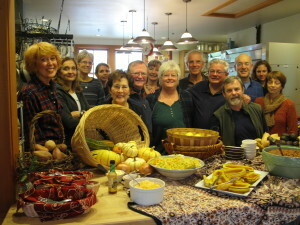 The Whidbey Institute is such a beloved part of our community. It just seemed right that one of the Six Bowls be used to serve food prepared by a loving chef, in a place blessed by the spirits of thousands of individuals seeking community, to a group of individuals exploring enlightenment, or Pure Awareness. kale with avocado and pickled onions at the O’Weisberger Thanksgivukkah celebration. 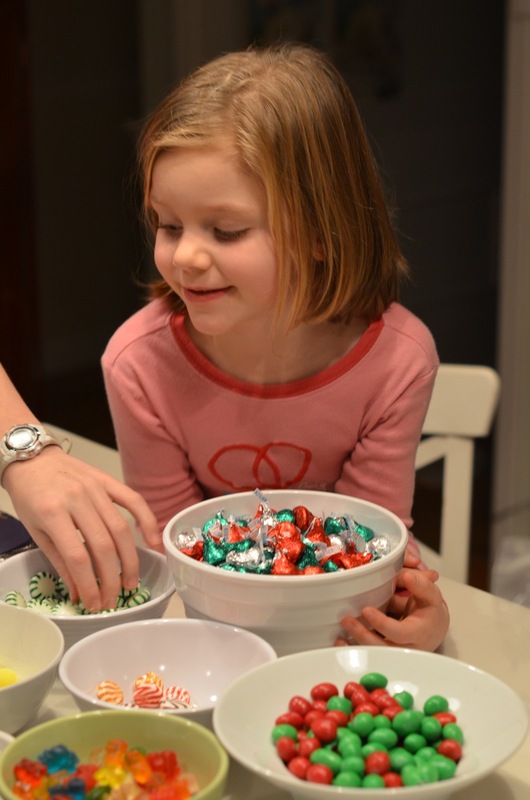 We used our beautiful bowl to hold a delicious salad at our Thanksgivukkah celebration. 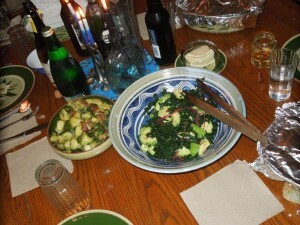 The salad was kale with avocado and pickled onions, very simple and delicious (as well as healthy). 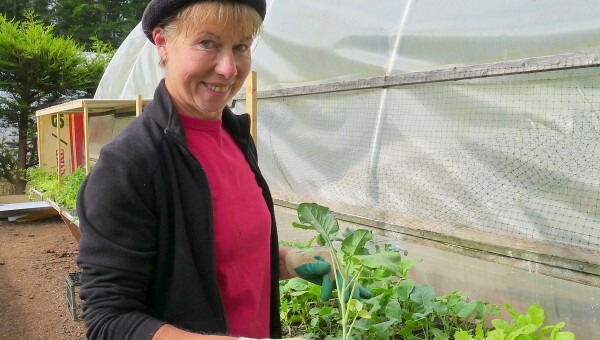 The kale came from the cooler at Greenbank farm and was lovingly grown by the young interns there. I chopped the kale, my daughter-in-law parboiled it, brined the onions in the simple vinaigrette, and our friend Rachel cubed the avocado, so the salad was a shared experience. Then my oldest granddaughter led the prayers for the second night of Hanukkah while her younger sister lit the candles. 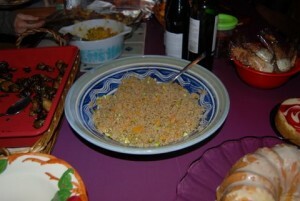 We then passed the food. I was truly thankful for so many things, not the least for being able to share the story of this project. 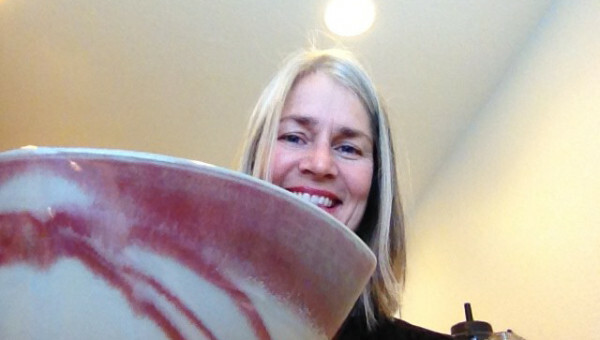 By the way, Judith, the potter who made this bowl, is at Bayview for the holiday market. I recognized her by her pottery and we had a chat. One more way the bowls build community. Joy.